Composer Justin Hurwitz won the 2017 Oscar for Best Original Score for La La Land, and won Best Original Song for City of Stars along with lyricists Benj Pasek and Justin Paul. 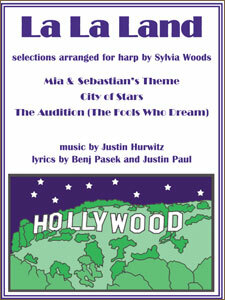 Now you can play three of the La La Land pieces on the harp! All pieces are in the key signature of 1 sharp, and require D# lever or pedal changes. The Audition also requires C# and G# lever or pedal changes. Fingerings and chord symbols are included in all pieces. The lowest note in each arrangement is the G, an octave-and-a-half below middle C. The range for Mia & Sebastian's Theme and City of Stars is 24 strings, going up to B. The Audition requires 26 strings, going up to D.